Logical Reasoning Section is considered as one of the most scoring section of Law entrance Exam. In these scenario, you need to create a Exam strategy to crack CLAT Exam. While creating a strategy you must be familiar with few things like weightage of Logical Reasoning in CLAT Exam, Books to refer for CLAT and other Law Entrance Exam, Important topics of Reasoning, and Expected question for CLAT 2018. Logical reasoning is an important aspect of all law entrance exams. This is an aptitude test where the examiners check your ability to reason, the agility of your brain and your ability to identify weak and strong arguments. 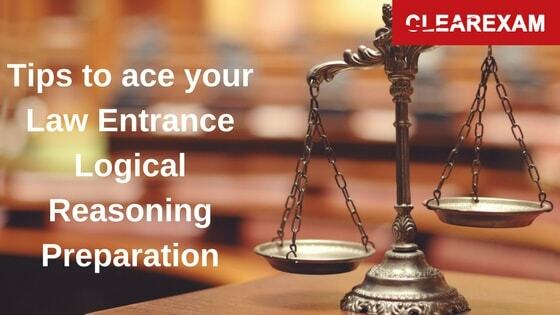 Read the post to know how to ace your Logical Reasoning preparation for Law Entrance Exam. First things first, the weightage of marks of this section in CLAT, AILET and DU LLB . The only Reasoning Preparation book that is recommended is, A modern approach to logical reasoning by RS Aggarwal. This is the best book that would find a mention in all CLAT preparation books. It is also talked about as an AILET preparation book. Strategy 1 is to definitely go through the past year papers. Questions do get repeated with minor changes and this will build your confidence. Strategy 2 is mock tests. More you practice the better you get. Strategy 3 is not letting many books pile up. This will only build pressure, and get you confused. RS Aggarwal, the one book, is sufficient. Strategy 4 is devising a method to save time. Try and learn tricks to solve questions faster. I) Family relationship based questions are often asked. Different relations between people will be notified in the question paper, and one has to apply logic to arrive at the relation between two given people mentioned in the paper. Expect 3 questions of this kind. The tip here is that to find the relation between A and B you must know the gender of A. So, start with that. An example is that you have to find out what day it is going to be on the 13 March in year 2021. You are given two facts. One is that December 25 of the last year was Tuesday and the last year was a leap year. The answer here is that both statements do not provide enough information to answer the question so pick that option. Tip : These are a little unnerving but also common sense questions if you remain cool. This segment is important from the point of view of DU LLB preparation tips. In coding decoding questions an artificial language is given for instance "Apple" means "CRRNG" in the new language then what will "sports" be in this new language. This is a fairly simple and scoring portion. Another important set of questions are about direction sense and using movement in different directions to find distance covered. Expect 3 questions from here. The tip is to make a direction diagram on a rough sheet, and that will make your work much simpler. This section tests your reasoning skills and knowledge of syllogisms. Strong arguments come from facts and weak arguments do not have facts to support them. Plus, it will be clear from the language as to which argument is weak and which strong. Strong arguments will have terms such as "most", "extremely", "absolutely" and weak arguments will have terms like " perhaps", "maybe", "sometimes"
This means seven easy questions straight in your pocket. Further, there are questions where one or more patterns are drawn on sides of a cube, and you have to determine the logical pattern which should come next. In a symbol series you will be given three symbols and you have to deduce the fourth symbol. The analogy should be found between first two symbols and applied to the third symbol. Usually, you will see that the second symbol has been arrived at by rotating the first symbol by a certain angle. For example 90 degrees. So, your answer figure will be arrived at by rotating the third symbol by 90 degrees. Only preparation and practice can make you score in this section. There are also mathematical sequences where there is a mathematical connection between given numbers, and you have to identify the next number in the series. In the number series there are various types. IX) Venn diagrams - All apples are oranges, some grapes are apples. Which grapes are oranges? Here oranges is the largest circle which holds all apples in it. Therefore, apples are the sub sets of oranges. The circles for grapes and apples intersect. Therefore the answer is some grapes are oranges. This answer has been arrived at by making different sets based on given information. This is called the venn diagram representation. X) Verbal classification kind of questions are important. There is a link between two words. You have to identify that link, and apply that to the next set of words to find out what the fourth word should be. For example, bird: sky :: ant:? Here, the relation between bird and sky is that bird moves in the sky, question is where does the ant move so the answer is " ground". These are quite simple to solve. This information now has covered tips, and expected questions of each type. Use elimination method whenever at a loss. Pick an answer choice, apply that to given facts and see which answer is correct. Do not forget that time is of essence. If you solve the question but spend 10 minutes on it then you were better off not answering that question. Ideally spend 1 minute per question. Devote an hour of study every day to this section, practice questions discussed above and do not go for rote method, and have clear concepts as this section gets very interesting once you get a hang of it. Practice makes perfect just like in Maths. Wish you luck! Read the Logical Reasoning tips to fetch high score in Reasoning Section of Law Entrance Exams. Read here the tips for CLAT Preparation.